SIOUX CITY — Even though he had retired from the plumbing and heating business, 80-year-old Earl Thelander liked to stay busy. On Aug. 28, 2007, he was cleaning up the basement of one of his rental properties in rural Onawa, Iowa, when an explosion occurred. Thelander, who suffered second- and third-degree burns over 80 percent of his body, died four days later at an Omaha burn unit. Authorities determined that just hours before the explosion, copper thieves had cut a propane line, which ignited when Thelander plugged in a fan to vent the gas fumes. A year after Thelander’s death, no arrests have been made, and theft of metals, including copper, remains steady in the state. According to the Iowa Department of Public Safety, 220 metal thefts were reported in the state in 2007, up from 89 in 2006 and 37 in 2005. The department noted that not all metal thefts are reported. So far in 2008, there have been 76 metal thefts documented statewide. Copper traded last week at about $3 a pound. On Sept. 14, officials say Dustin William Coates and Anthony Gene Heitman, both of Paullina, Iowa, stole a brass bell weighing nearly 500 pounds from Oakdale Evangelical Free Church in Meriden, Iowa, and sold it at a salvage yard in Lakefield, Minn., for about $530. It was later recovered by the Jackson County, Minn., Sheriff’s Office and returned to the congregation. Cherokee County Sheriff’s Deputy Jeff Friedrickson said the theft was an isolated incident for the county but not for the area. Sioux City police Lt. Marti Reilly said thefts of “precious metals” are on the rise in Sioux City. In April, Troy Jones, 39, and Carl Binneboese, 24, stole copper tubing and wire and multiple pieces of stainless steel from a Cargill Inc. work site. The two men were charged with second-degree theft, a class D felony, after surveillance footage of the burglary was distributed to the public. Both Jones and Binneboese pleaded guilty to the charge in a plea agreement and are awaiting sentencing. The maximum sentence for second-degree theft is five years imprisonment. A 30-pound bronze statue of a male dancer was stolen from the 500 block of Fourth Street in June. The 2008 Sculpt Siouxland project entry was thought to have been melted down for its copper value, which was estimated at about $60. Over the past year, Spencer Police Chief Mark Lawson said, several copper thefts have been reported on the edge of town. He said a bronze bust, copper kettles and a commercial stove were stolen. “There’s a legitimate market for it, and there are people that get a little bit greedy and decide that they’re going to steal that copper pot or a bunch of fence posts or some aluminum steel girders that are sitting by a construction site,” Lawson said. Lawson said he believes that most of the items were taken to salvage yards so thieves could cash in on the metal’s value. Mike Potash of Compressed Steel Co. in Sioux City, said he sees lots of copper coming into the yard to be recycled. He said that it is impossible to tell the difference between legitimately obtained copper tubing and copper tubing that has been stolen. He said he is on the lookout for things that typically would not be brought in by the general public, including cemetery plaques and municipal castings. When he suspects that an item might be stolen, Potash said, he informs police, asks the customer to sign a statement indicating that he or she owns it, or refuses to take it. The department of public safety reports that as the housing market has declined, opportunities for metal thefts are reduced, so law enforcement officers are seeing more variation in what is stolen — catalytic converters in SUVs; truckloads of metal, which can be transported if the tractor and trailer are stolen; and farm implements that sit out in fields or sheds. 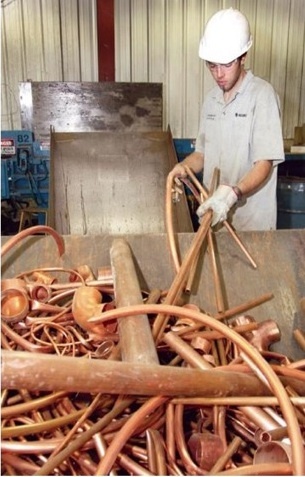 Thieves stripped copper tubing from farm equipment in Clay County, according to Sheriff Randy Krukow. He said farmers noticed copper tubing missing from a grain dryer when they tried to turn it on. Nothing was ignited, according to Krukow. “We just want to make people aware that if they haven’t tested something that they may have hooked up at an abandoned farm site, that they check on it,” he said. Ewing, who maintains a Web site about Iowa cold cases, added her stepfather’s case to the list of unsolved homicides. She and her family are holding out hope that someday the thieves who took her stepfather’s life will be brought to justice. “After a year the chances are just getting slimmer and slimmer that they’ll be caught, but we still have faith that someone will eventually come forward and do the right thing,” she said. — Alert homeowners to the presence of strangers in their vicinity. — Report suspicious activity to police. — Report all thefts to police immediately. — Routinely check machinery at farm sites, your furnace and other appliances. — Install motion-sensitive lights and surveillance cameras at construction sites. — Use unique markings on metal items to deter theft or assist in identifying stolen metal. — When you are away, ask neighbors to keep an eye on your property.